You might be questioning – is horse ownership right for me? Here are some topics to consider before purchasing or adopting an Equine. Why do I want to own a horse? There is no right answer, but understanding your true motivations for owning a horse will help you determine if there might be better options available. Do you want a horse for recreation or showing? Do you want one because your friends have one or because you’ve dreamed of owning a horse as a kid? Are you trying to earn money by breeding or racing? Do you want to save a horse in need? Should you consider leasing, lessons, 4H, fostering, or volunteering first? Do I understand all the costs associated with owning a horse? Over the years, the demand for horses has run in cycles that frequently follow other economic trends. The initial cost of purchasing or adopting a horse is only a small portion of what goes into the financial responsibility of Horse Ownership. 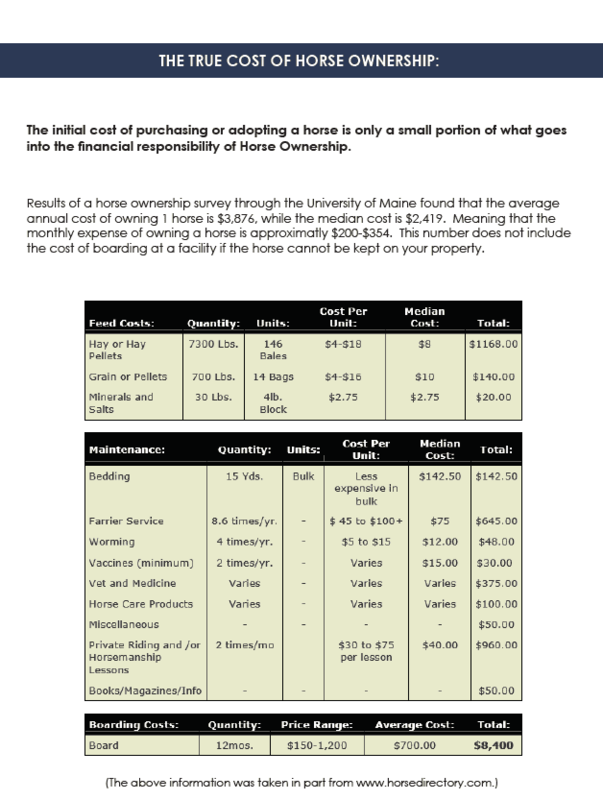 Results of a horse ownership survey through the University of Maine found that the average annual cost of owning 1 horse is $3,876, while the median cost is $2,419. Meaning that the monthly expense of owning a horse is approximately $200-$354. This number does not include the cost of boarding at a facility if the horse cannot be kept on your property. How long do I plan on owning my horse? Many horses live for 20 years and some can live for more than 30 years. If you cannot make at least a 20-year commitment to a horse, you should have a plan to provide for your horse or investigate ways to sell your horse when you can no longer take care of it. Am I planning to relocate? Moving with a dog or cat usually isn’t too difficult, but moving an animal that weighs 1,000 pounds can be. If your lifestyle requires multiple relocations, you must be prepared for the expense and logistics of moving a horse. Leasing is a good option. Is this horse for my child? home soon or his or her interests might change, leasing is a good option. Do I have the knowledge and skills needed to care for all the horse’s needs? professional help from your veterinarian, farrier, and trainer is always in the best interest of the horse. What will I do if my horse becomes sick or injured? sometimes lengthy follow-up treatments or pay a knowledgeable horse person (e.g. barn manager) to help you. It is also important to have money set aside in the event of a medical emergency as veterinary emergencies can be costly depending on the situation. Who can I consult about caring for my horse? A certified vet and a skilled farrier will be invaluable resources when it comes to your horse’s heath, happiness, and soundness. An experienced trainer, instructor, or barn manager should be able to answer many questions regarding your horse’s day-to-day care and training. There are countless books, magazines, and websites available that will offer tips and ideas for managing your horse. Use these resources to educate yourself but be sure to consult with a trusted equine professional before trying anything new.